At the age of 16, Jenny had had difficulty managing her weight since entering puberty at an early age. She craved carbohydrates “all the time,” even after eating dinner, and complained that her weight had been increasing at a rate of 1 to 2 lbs per month over the past year. Jenny had seen a dermatologist for acne on her chin after never having had an acne problem before. She also had visited her primary care physician for dizziness, feeling shaky, and irregular menses. Her doctor started her on a birth control pill to regulate her periods, diagnosed Jenny with hypoglycemia, and encouraged her to follow a South Beach-type diet to moderate her blood sugar and help her lose weight. Twelve years later, Jenny went off her birth control medication because she was ready to start a family. Her periods never returned. Despite her efforts, Jenny couldn’t lose weight and struggled with severe hypoglycemia and had elevated serum triglycerides. Jenny saw a reproductive endocrinologist who diagnosed her with polycystic ovarian syndrome (PCOS). PCOS is the most common endocrine disorder in women, affecting 5% to 10% of those of reproductive age.1 Recognized in 1935 by Stein and Leventhal for its relationship to menstrual disturbances, PCOS is characterized by high levels of androgens (male hormones such as testosterone) from the ovary and is associated with insulin resistance. Small cysts called poly cysts usually, but not always, surround the ovaries and appear like a strand of pearls on an ultrasound examination. The cysts develop from hormonal imbalances. Signs and symptoms of PCOS usually appear at the onset of puberty when there’s a normal increase in insulin levels as part of human development. PCOS is linked to the development of chronic diseases later in life such as the metabolic syndrome type 2 diabetes, heart disease, hypertension, and endometrial cancer, so early recognition and treatment are critical to prevent these conditions. Because most adult women with PCOS aren’t diagnosed until after seeking help with infertility, early detection in adolescence could prevent financial and emotional hardships down the road. Many of the signs and symptoms of PCOS can be detrimental to a young woman’s body image, particularly weight gain, excessive hair growth on the face and body, dirty looking patches on the skin called acanthosis nigricans (all of which are clinical markers of hyperinsulinemia), and acne. Such symptoms can negatively impact the emotional health of adolescents at a time when self-image is developing. In addition, mood disorders are common among adolescent girls with PCOS.4 Such disorders typically stem from hormonal imbalances or struggles with body image. Not surprisingly, many girls with PCOS suffer from eating disorders as they attempt to manage their out-of-control weight gain, mood, and body image issues. • polycystic ovaries on a pelvic ultrasound, with exclusion of other causes. These criteria may not be appropriate for all adolescents as some girls with PCOS may experience regular menses or not have cysts. Some physicians contend that an invasive pelvic ultrasound exam in young girls is unnecessary and even cruel. Although insulin resistance seems to be a hallmark feature of PCOS, insulin resistance isn’t currently part of the diagnostic criteria. Screening for abnormal glucose tolerance in adolescence is important because early treatment can prevent further metabolic consequences. According to a paper published in the February 2002 issue of Pediatric Research, the appearance of pubic hair in girls before the age of 8, called premature pubarche (PP), should be an early marker for PCOS due to the metabolic similarities of girls with PP and women with PCOS. A client’s answers to the questions shown in Table 2 may suggest she has undiagnosed PCOS and that you should consider referral for diagnostic testing. Table 3 lists the common lab tests physicians order to help detect and monitor PCOS. Sometimes simply asking a client whether she’s ever been told by a healthcare provider that she’s had any abnormal lab results can suggest the possibility of PCOS. I once worked with a 15-year-old whom I suspected had PCOS because of her struggles with weight, acne, and irregular periods. When I asked her about abnormal lab results, she said she was told once that she has high testosterone levels but had never been diagnosed with PCOS. She had just been put on birth control pills to regulate her periods. Diet and lifestyle changes are usually the first line of approach for treating young girls with PCOS. According to The Dietitian’s Guide to Polycystic Ovary Syndrome, the optimal diet composition is still unclear for PCOS patients, although the type and amount of carbohydrate appears to matter. A study published last year in the American Journal of Clinical Nutrition examined the effects of a low glycemic index diet compared with a conventional low-fat, high-fiber diet on women with PCOS. They found that women who followed a low glycemic index diet had better insulin sensitivity and more menstrual regularity. Those findings support a large study published in The Journal of the American Medical Association in 2007 that reported a low glycemic load diet facilitates greater weight loss in overweight individuals with high insulin levels. Research has indicated that very low-carbohydrate diets (less than 30% of total calories) aren’t superior to other diet compositions for women with the syndrome. Dietitians who counsel women with PCOS report that their clients crave carbohydrates more than people without PCOS. Some adolescents may find severely limiting carbohydrates too difficult to achieve, which could contribute to binge eating and weight gain in the long term. 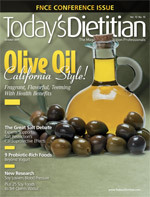 Omega-3 fatty acids—including alpha-linolenic acid, EPA, and DHA—are beneficial to women with PCOS because they can reduce insulin and triglyceride levels and aid in regulating hormone levels.7 Adolescent patients should be advised on ways to incorporate foods rich in all forms of omega-3 fatty acids into their diets. Such foods include fatty types of fish or fish oil supplements, nuts, flax, and olive and canola oils. Adolescents with PCOS need education about low glycemic index foods, appropriate portion sizes, and ways to reduce their intake of simple sugars. Since many teens tend to skip meals, dietitians need to stress the importance of eating every 3 to 4 hours and including protein with meals and snacks to help manage blood sugar levels and prevent hypoglycemia. Provide examples of healthier food choices for when they eat out with friends. Both the patient and her parents need to be educated about PCOS and insulin resistance and the connection with symptoms, including weight gain. Insulin is a very powerful growth hormone that promotes weight gain, sometimes despite diet and exercise efforts. This information could be validating to a young girl who has felt blamed for her weight gain or failed attempts to control weight. Encourage physical activity for girls with PCOS because exercise can help lower insulin levels and manage weight. Keep in mind that adolescents struggle with body image and may resist exercise; recommend activities that are size appropriate and comfortable to participate in with excess abdominal weight. Though unproven, it seems that women with PCOS tend to build muscle more quickly than others, possibly due to having higher testosterone levels. Some women with PCOS find weight training more enjoyable than aerobic exercise. It’s easier to do and feeling stronger often improves their body image. PCOS is a common and complicated endocrine disorder that often goes undiagnosed. Formal diagnostic criteria and more evidence-based dietary guidelines are needed. Adolescents with PCOS experience many symptoms that can have a significant and long-term impact on their self-esteem and body image, and they’re at a higher risk for developing an eating disorder. The syndrome puts people at risk for chronic diseases and infertility later in life, making early recognition and treatment key. Dietitians should screen adolescent clients they suspect may have PCOS and recommend further diagnostic testing. If a client is diagnosed with the disorder, RDs should provide proper dietary and lifestyle management. — Angela Grassi, MS, RD, LDN, is the author of The Dietitian’s Guide to Polycystic Ovary Syndrome and The PCOS Workbook: Your Guide to Complete Physical and Emotional Health. She is the founder of The PCOS Nutrition Center where she provides nutrition counseling to women with PCOS. 1. Azziz R, Woods KS, Reyna R, Key TJ, Knochenhauer ES, Yildiz BO. The prevalence and features of the polycystic ovary syndrome in an unselected population. J Clin Endocrinol Metab. 2004;89(6):2745-2749. 2. Xita N, Tsatsoulis A. Fetal programming of polycystic ovary syndrome by androgen excess: Evidence from experimental, clinical, and genetic association studies. J Clin Endocrinol Metab. 2006;91(5):1660-1666. 3. Bridges NA, Cooke A, Healy MJ, Hindmarsh PC, Brook CG. Standards for ovarian volume in childhood and puberty. Fertil Steril. 1993;60(3):456-460. 4. Himelein MJ, Thatcher SS. Depression and body image among women with polycystic ovary syndrome. J Health Psych. 2006;11(4):613-625. 5. Salmi DJ, Zisser HC, Jovanovic L. Screening for and treatment of polycystic ovary syndrome in teenagers. Exp Biol Med. 2004;229(5):369-377. 6. Marsh K, Brand-Miller J. The optimal diet for women with polycystic ovary syndrome? Br J Nutr. 2005;94(2):154-165. 7. Bhathena SJ. Relationship between fatty acids and the endocrine system. Biofactors. 2000;13(1-4):35-39. “What types of foods do you crave and when do you crave them?